This two-hour radio program features original Rockers selections, new tracks from Eesah, Kranium and more. Also this segment has the beginning conversation about Hon. Marcus Garvey, Rev. Dr. Martin Luther King, Jr. and Fred Hampton. 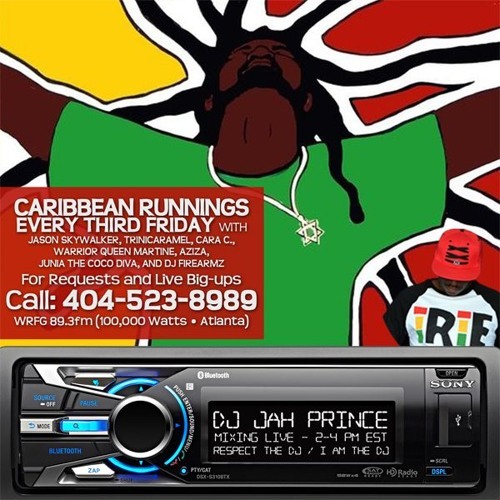 Caribbean Runnings is Atlanta's longest-running and #1 Caribbean radio program! The show airs each and every Friday from 2-4PM on WRFG 89.3FM Atlanta and streaming online at www.wrfg.org. 89.3FM provides a voice for those who have been traditionally denied access to the broadcast media and the involvement of a broad base of community elements to guarantee that access. Caribbean Runnings plays handpicked reggae, soca, dancehall, calypso and more! Our past guests have included top names in the Caribbean music industry. We also discuss pertinent and relevant political and social issues affecting the Caribbean diaspora.